It's been a special and blessed month here in Israel as we are celebrating and keeping the appointments of the Lord with the Feasts of Tishri. On the first of Tishri, we celebrated Yom Teruah, Day of the Sounding of the Shofar. The only thing that is mentioned in the Bible about this Feast is that we are to set this day apart and sound the shofar. Traditionally, this day is known as Rosh Hashana and is considered the Jewish New Year and is celebrated with family gatherings and extensive meals and is a long two day holiday. We were blessed to have family and friends come to our house and as we blew the shofar, we gave thanks to the Lord for his faithfulness and we expressed our gratitude to God that in his mercy, he allowed us to welcome in 5779 with those we loved! Ten days following Rosh Hashana is the solemn Day of Atonement, Yom Kippur. From sunset to sunset, the Jewish people fast and pray and repent before God for the sins committed over the past year, in hope that their names will be written in the Book of Life for one more year. Again with a grateful heart that we were able to participate, we joined our congregation along with two others and the Revive Israel team. This is something we have done for at least 10 years and it is always a very special and deep time in the Lord. We gathered together for the 24 hour time of prayer and fasting and rejoiced in the fact that our names are indeed written in the Book of Life by the blood of the Lamb! We gave thanks for the incredible forgiveness we all have received in Yeshua our Messiah. We interceded and cried out for our unsaved family and nation, proclaiming his word that in the end, "all Israel will be saved." And in a dramatic and prophetic closing, the last great shofar blast was sounded as we all proclaimed seven times: "Blessed is he that comes in the name of the Lord" - the declaration that will precede the return of the Lord to Jerusalem. Three days following the end of Yom Kippur, we began the joyous week long Feast of Tabernacles, Succoth. This Feast is the remembrance of the time in the desert that God kept the Israelites throughout their 40 years as they lived in temporary dwelling places, known in Hebrew as a "succah". The Bible instructs each family to build a "succah" and to live in it for the 7 days. Throughout the country, in almost every home and in front of every restaurant, Succah's are built and decorated and most people at least eat some meals in it. The more radical will actually sleep in it for the duration of the holiday. As this Feast goes on for seven days, it is an incredible celebration here in Jerusalem. Several large International ministries are having special and very festive conferences. The streets are teeming with believers who have come to the city to celebrate the Lord. There is singing and dancing everywhere! 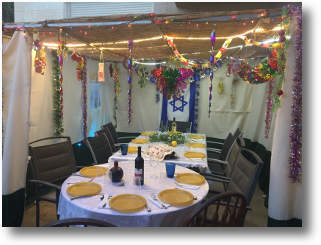 In the local families, it is a special time of getting together, as friends and family are invited to sit in each other's succah. Schools are closed and many work only half days. Families take this vacation time and go on trips and travel around the country. Congregations have special times of celebration as we all join together and remember and look forward to all that God has done and all that he will do before the end. Also in celebration of the Feast, we are having our "Third Season" meeting at our house on Friday, 28th. This is the first time in many months, since the discovery of the latest outbreak of cancer that we are doing this. We are excited to be able to host this wonderful event as those of us in the third season of our lives come together to bless the Lord and each other! Please pray for strength and health for me especially as I will be having my regular biweekly treatment on the 26th. Pray that there will not be any negative side effects and I will have energy for this gathering I have eagerly waited for! Finally, in celebration of the last and final day of the Feast, our congregation Ahavat Yeshua along with several other Messianic congregations will be having a joint service in which we welcome all those from the nations to rejoice with us in worshiping the God of Israel. For this one day, we will have our service in English as well as Hebrew. 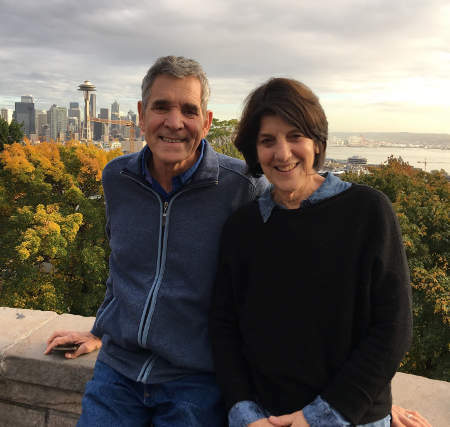 We want to honor our dear family from the nations who come here to express their love for our people and this nation and who support the Israeli Messianic Body in every way! And finally as we celebrate this Feast, we want to take a moment and express our love and blessing to you. Whether you have been able to come up to Jerusalem or are far away, we pray that the joy of the Lord will fill you and his great love will overflow from you to all those who need him so desperately. May this be a year of great breakthrough throughout the world as his word goes forth in power and his Kingdom is increased in every place.